Whether you are into off-road biking for fun, professionally or just to keep fit, not being able to cycle outdoors because of bad weather can be frustrating. However, snow, rain or strong winds don’t have to get in the way of your cycling routine. All you have to do is invest in a bike trainer. This piece of equipment will turn your mountain bike into a stationary cycling station that simulates any outdoor terrain. Choosing the best mountain bike trainer to purchase is not as easy as it is presumed to be. There are several aspects worth considering depending on the type of trainer you are looking for. Common pitfalls when buying trainers are such as buying trainers that are excessively hard to assemble, poor quality, and complex to use. This is why there is a need to be careful when choosing indoor bikes so that you only settle for the ideal model and brand. Some of the considerations to make when buying these trainers include cost, accessories, features, and ease of use among other aspects. What is a Bike Trainer? For you to be able to use a bike trainer, it is best to first understand what it is and how to use it. A bike trainer is defined as a training appendage that is attached to a normal bicycle to turn into a stationary bicycle. It is a useful and versatile tool that is used at the comfort of your home for your fitness regime or for training to become a better cyclist. It is arguably more comfortable and more effective as compared to normal cycling. Below we are going to look at the best mountain bike trainers to help you choose a quality and affordable product from a reputable brand. Here are some of the best bike trainers on the market. 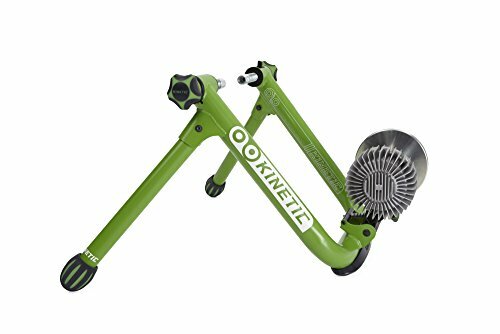 If you are looking for an indoor bike trainer that allows for some challenging workouts, this unit from Kurt Kinetic is worth considering. Its leak-proof fluid resistance progresses with the cycling speed. So, the harder you pedal, the more challenging your workout gets. The precision-calibrated fluid resistance and 6.25-pound flywheel help to create a realistic feeling of cycling on the road. The Road Machine 2.0 fluid trainer is compatible with the Kinetic inRide Watt Meter. Therefore, you will be able to track your power wattage, speed, and cadence. All performance stats can be viewed on the Kinetic Fit app. Mountain bikes with 22 to 29-inch wheels will easily fit into the frame. The entire unit comes fully assembled, so it is ready to use right out of the box. Despite weighing, 28pounds, moving this trainer should be easy since it has a foldable frame. When it comes to build quality, this fluid bike trainer does not disappoint. The twig welded, powder coated steel frame and aluminum structural components are designed with durability in mind. You will also love the fact that this fluid trainer is mostly quiet. It comes with a skewer and you can buy the trainer with an optional floor mat or ring riser. If you’d like to learn more about the importance of grip check out our buyers guide section on our article – Best Mountain Bike Grips – Which One Should You Choose? The second contender on the list is also a fluid resistance trainer. The CycleOps Fluid 2 trainer has a hydraulic chamber that adjusts resistance as you ride. Along with its precision-balance flywheel, the trainer creates an authentic road-like feel. With a resistance range of 20 – 779 watts, this bike trainer will grow with you. What’s more, there are no complicated manual adjustments to make. Simply, increase cycling pace to generate more resistance while switching bike gears like you would on an affordable bike. There is even a handy quick load lever that locks your preferred resistance. This makes it easy to start at your preset resistance every time you start to use the trainer. Noise levels from this fluid trainer are moderately low. You can expect noise readings of 64-68 decibels when cycling at about 20 miles per hour. Two cooling fans on either side of the flywheel allow this unit to perform better for long periods. CycleOps designed the Fluid2 trainer using 16-gauge steel tubing with a 2-inch thickness. The unit roller only accommodates 650b, 700c or 26-29inch wheel bikes. You can choose to buy the trainer alone or with additional accessories. One package includes a couple of climbing blocks, sweat guard, and a floor mat. Alternatively, you can opt to buy the bike trainer along with a power training kit with a joule cycling computer and power meter to track your performance. The Conquer Indoor bike trainer offers the best combination of value and performance. This is the least expensive trainer on the list. However, the manufacturers designed this unit without compromising on quality. The frame is made from high tensile steel. You will also enjoy better stability on this trainer thanks to the horizontal stabilizing bars that have adjustable end caps. Keep in mind that this bike trainer uses an internal magnet to generate resistance. Rotating magnets inside the flywheel generate drag against the rear wheel to make your workouts more challenging. You have to turn a manual knob to adjust resistance or simply shift gears if you don’t want to interrupt your workout. The Conquer indoor bike is quite simple to use. No tools are required to put it together. Simply unfold the frame when it arrives. Your package will come with a free skewer for quickly releasing the rear wheel. The extra wide frame is compatible with 700c, 26-inch, and 27-inch wheel bikes. As an added bonus, the Conquer Indoor bike trainer offers a free riser block to suspend your front wheel. The frame can fold up into a nice compact size as well This means you do not need a lot of space to store the bike trainer and you can carry it with you anywhere when traveling. 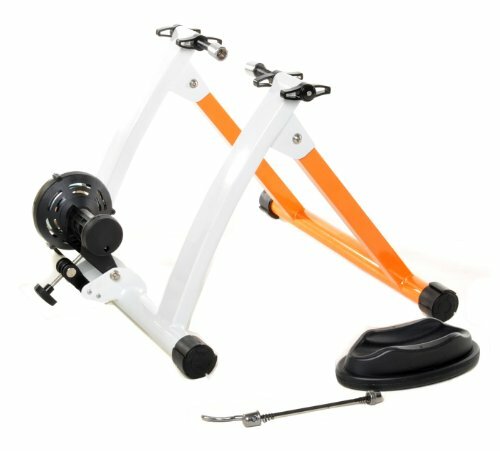 Are you looking for a classy indoor bike trainer? If yes, look no further than at this unique RAD Cycle bicycle trainer. This easy to set up bike prides itself on having a smooth and quiet operation. 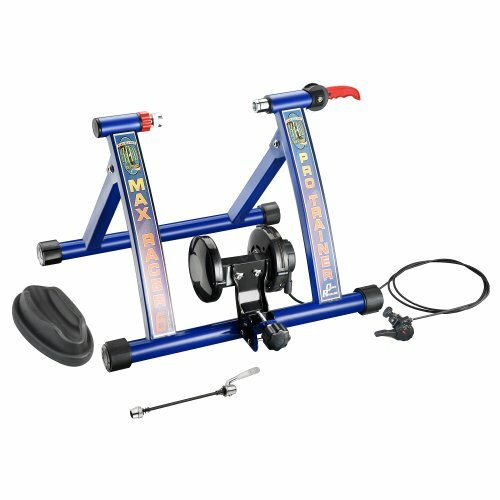 RAD cycle trainer is designed uniquely to provide its users with reliable performance throughout its life. The most fascinating about the bike is that it is easily portable. Additionally, it folds easily thereby making its storage and transport effortless achievable. The trainer perfectly fits mountain or road bikes that have 26,27 and 700cc wheels. This RAD Cycle bike trainer has an Anti Slip pad for the bike’s front wheel thereby guaranteeing the best training experience. What is more amazing about the bike is that it features high-end technology that provides a seamless performance and unrivaled reliability. This RAD cycle bike trainer has a sturdy frame and extra wide legs that make the bike amazingly stable. 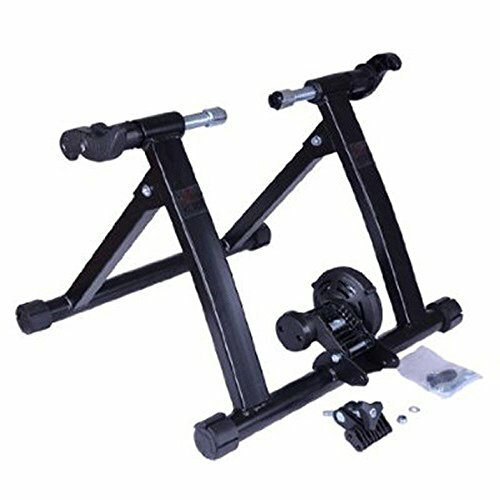 The materials used in the design and consequent construction of this beginner bike trainer are of the finest quality and boost of proven reliability. The trainer is specifically engineered and styled for endurance training without the bike’s performance or reliability declining throughout its use. Since the trainer is considerably lightweight and portable, you can move it around the house to your most convenient training spot. The Magnet Steel Bike Indoor Trainer is easily adjustable, durable and provides its users with a frictionless ride. Featuring a quiet design, the trainer produces low or no noise at all thus allowing its users to enjoy a peaceful training session. This makes the trainer easily foldable for convenience when traveling or storage. 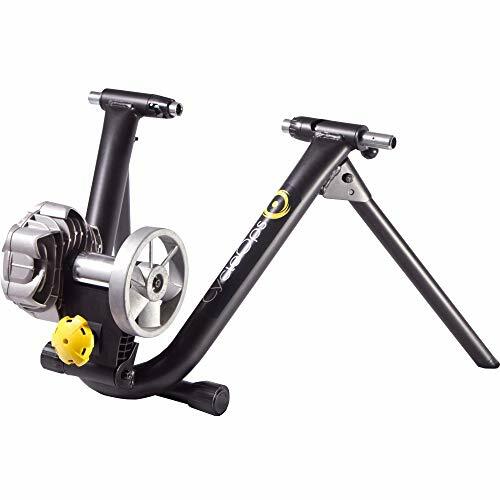 The best thing about this Magnet Steel Bike Trainer is that it features a classic magnet system that enhances its performance, reliability, and durability. What is more amazing about the magnet system is that it provides a progressive magnetic resistance that increases gradually with an increase in speed. The trainer’s resistance is easily adjustable using the micro adjust knob to meet your training needs and preferences. These trainers are uniquely reliable in enhancing the fitness of average cyclists. When using the trainer, you need not worry about the firmness and stability of the bike sturdy construction and strong frames. This is because the sturdy construction and amazingly strong frames of the trainer enhance its stability. The design of the trainer ensures that it provides a firm and stable support to the bike. As such, you need not worry about falling off the bike when training. Cyclists looking for a classic bike trainer with a sturdy frame and a high-end magnetic resistance should look no further than at the Soozier Magnetic Resistance Trainer. This trainer comes with a precision-machine roller that is designed to reduce wear and tear of the tire. The bike mounting system in the trainer locks down on quick release and bolts effortlessly on 26”, 27” and 700C wheels. The trainer prides itself in being one of the smoothest performing and quietest trainers in the market. The Soozier Magnetic Resistance trainer weighs 20 lbs. and has a compact size measuring 23.5” by 23.5” by 16”. Like other high-end trainers on the market, this Soozier Bike trainer comes with a sturdy and strong steel frame that allows for secure and safe cycling. If you are looking for a trainer that is easy to store and travel with, then this Soozier Magnetic Resistance is the ideal trainer to purchase. The tension of the wheel is fully adjustable thus allowing you to set the resistance to your most preferred level. In addition to magnetic resistance, the trainer features a highly functional design that allows for lively and exciting cycling sessions. The trainer is fine-tuned to provide the best magnetic resistance for reliable training and fitness, especially for pro cyclists. Since the trainer is solidly built, it provides unmatched reliability and performance throughout its life. 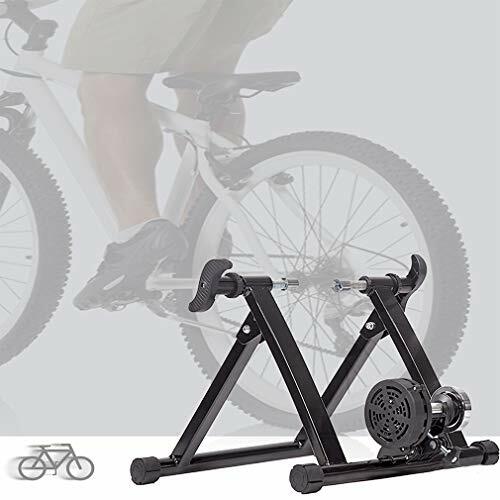 The Nashbar Radius Rollers trainer is designed for use by cyclists who are looking forward to enhancing their bike handling skills, sharpen fitness, and eliminate roughness from their pedal strokes. The 85 mm thick CNC-Machined drums generate enough resistance for strength building while still providing users with the option of jacking the RPMs to desired levels. The sealed cartridge bearings in the trainer provide for its smooth and noise-free operation. The trainer’s aluminum frame measures 50” by 18” and comes with 9 settings for different wheelbase sizes. There has been unlimited effort and skills that are invested in the design and consequent construction of this trainer. This, in turn, has given rise to an amazing roller with uniquely high-quality features and accessories hence excellent durability. Since the rollers are well built, you need not worry about extensive wear and tear when using the trainer for your practice and fitness needs. The rollers are pre-assembled thereby making it possible to use them right out of the box. There is no assembly or fitting required when using the trainer. Inexpensive to purchase and maintain. If accorded the appropriate care and maintenance, the rollers can last for ages without breaking down or becoming faulty. This provides great value for money especially since they are also affordable to purchase compared to other high-end trainers. Ideally, the trainer is designed to provide you with power and balance when polishing your cycling skills during winter. When looking for the best indoor bike trainer to purchase, it is advisable to undertake a wide search for the best and ideal trainer for you depending on your needs. This comes in handy in ensuring that you only purchase a trainer of reliable use and importance to you. The bike trainer is the ideal fitness equipment to accompany you in the recovery of a sporting activity. Accessible to all, it combines the effects of the stepper, the rower, the running and the exercise bike, for a complete and gentle training. The workout on bike trainer helps you keep fit and can be recommended during the rehabilitation period after injury. The movement in ellipse and balance on the pedals allows soliciting 80% of the muscles of the body, all without impact traumatizing for the joints. You must feel comfortable on your mount. Here are some guidelines to better adjust your position. It is essential to be able to adjust the height of the saddle and the handlebar but also the depth between its two elements. You may end up sticking to the handlebars or lie on it without the possibility of varying your posture. To adjust the seat height, it’s straightforward: When one of the pedals is placed all the way down, you should keep the leg slightly bent a few degrees. If you stay with one knee too flexed, pull up the saddle, your back will thank you. Stand next to your bike. The handlebar must be positioned at hip height. Placed too much, your lumbar could be sore very quickly. Your arms must remain free to practice for a long time without excessive fatigue. Remember to tighten the straps keeping your feet on the bike pedals for your safety. The purchase of an exercise bike is often the resumption of physical activity. If you do not want to store your new acquisition in the garage, here are some keys to practice and progress. Some bikes are offered with huge seats. Try the bike and opt for the most comfortable saddle model. The practice of cycling can give you back the shape but can also hurt you if it is not adjusted according to your morphology. The ease of adjustment is essential. The intensity of the exercise involves a significant caloric expenditure, between 500 and 1000 calories for 1h of practice. The pace of exercise helps you develop and maintain your cardiovascular endurance. The range of motion engages the whole body for a complete muscular strengthening. Choose an exercise bike in the bike shops you will find a wide range of exercise bike. To be sure to make the right choice, to have a reliable and comfortable product, here are some important points to keep in mind. Forget the gas machines offering multiple functions on the control screen. Resistance setting, time and distance are the basics. If you wish and beyond 50 years, add the heart rate monitor function to track your heartbeat. 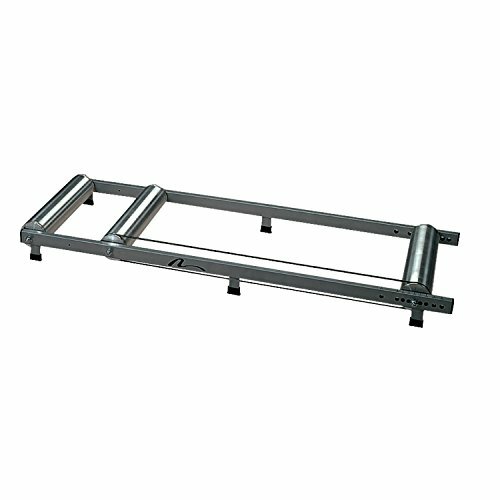 lf you have some mobility problems, opt for an open frame to install yourself easily. On the other hand, for cyclists who want to complete their training, it is possible to purchase real racing bicycles but “indoor cycling” to find the sensations of a real outing in kind. 15-20” maximum to get your body used to the new effort. For the most aggueri, 30 to 40” always in flexibility allow a smooth adaptation. The benchmark of these first practices is to have a rhythmic and regular pedaling, without jolts. The flywheel that allows you to add resistance will allow you to adjust this precise point. When these first sessions are assimilated, you have two choices according to the time allotted to your sports practice. I extend my courses to improve my endurance in flexibility through regular sessions lasting 40 to 60”, I want to strengthen my muscles and burn a maximum of calories through a training meant accelerations on 20 to 40 seconds and slower phases. It is advisable, at the beginning of each session, to engage a progressive introduction to warm up one’s muscles and to wake one’s heart. In the same vein, think of slowing the pace 5 ‘before the end of your training during what is called the cool-down. This moment allows you to get out of the exercise and recuperate your efforts. Bad weather, darkness or an illness can stop you from utilizing your daily fitness routine, especially if the routine has to be done outdoors; for instance cycling. It is important to find a simple fitness regimen that you can make use of during those days that you cannot go outside. Using a bicycle trainer is one of the most affordable and effective ways to exercise while indoors particularly for cyclists. For one to use a bike trainer effectively and reap the most out of the experience, it is of crucial importance to understand how to set it up perfectly. Unfold and fasten the legs of your trainer, ensuring that the legs are stable and level before you install your bicycle. Attach the trainer’s skewer to prevent the normal skewer from being damaged. Place your bicycle in the trainer, attaching it to the appropriate slots. Position the wheel on the resistance roller and fasten the adjustment knob to secure your rear shaft into place and the roller to come into contact with the rear tire. Lift your front wheel off the ground using a riser block to level off the bicycle. Basically, setting up the bike trainer is the same all around with all the types of trainers. There are various types of bicycle trainers out on the market. As a cyclist who is purchasing a trainer, you need to know what exactly are your goals as well as what are you looking for in a trainer. Bike trainers range from quality mag trainers such as the CycleOps Magneto; to the fluid trainers such as Cycleops Fluid 2; or to the more traditional wind trainers that are said to be noisier when they reach their limit as compared to the others. There are quite a number of benefits to bike training as compared to cycling. Constructive training in a controlled environment. You can set up your bike trainer in any place or room in the house that you deem fit. Furthermore, you can set goals as per what you think is achievable by your body at that particular time From there, you are able to tune your body to continuously aim higher and train harder. Developing a pedal stroke posture. Training in the comfort of your own home provides the best environment to develop and retain proper pedaling posture. For better results, I suggest that you use a mirror, both in front and behind your trainer, to criticize your own posture. Bike training aids in developing the habit of maintaining a proper posture while cycling, whether it is for fun or in racing competitions. Bike training is much comfortable and the terrain never changes hence you can always rip off maximum results. Here are a few tips on bike training. Ensure that your bike trainer is set up correctly. Practice a smooth and right pedal stroke while training to make you a skilled cyclist. Always make sure that whatever you learn and practice while indoors will apply to your outside riding. Dress lightly and ensure that you set up the bike trainer in a room that is well aerated to ensure proper air circulation while you cycle. Similarly, place your towel close to you when cycling to wipe off the sweat. However, if you find it difficult to do it by yourself, you can always join a group or invite your friends to join you while you work out. Regardless, bike training is a great way to exercise. With the above list of best mountain bike trainers, you have no excuse to sit on the couch during bad weather. These trainers let you cycle indoors in the comfort of your own horn. The varying prices among the defending units cater to different budgets. However, the cost is not the most important factor to consider only when shopping for a bike trainer. Make sure to compare the features carefully before making your final choice. To make an informed decision, take your time to choose a bike trainer that offers features which meet your specific needs.